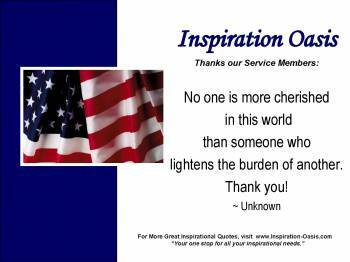 I've compiled a beautiful collection of Veterans Day quotes along with a very inspirational video tribute to our veterans. I have such an appreciation for our servicemembers. Please let the veterans and servicemembers in your life know how much you appreciate them. No one is more cherished in this world than someone who lightens the burden of another. Thank you. When our perils are past, shall our gratitude sleep? There is an amazing something in the American psyche which speaks about courage, and it says, 'Yes I can,' ... Yes, we will overcome it all because we have the spirit to do so. Without heroes, we are all plain people, and don't know how far we can go. Heroes take journeys, confront dragons, and discover the treasure of their true selves. I believe it is the nature of people to be heroes, given the chance. And each man stands with his face in the light of his own drawn sword. Ready to do what a hero can. My heroes are those who risk their lives every day to protect our world and make it a better place–police, firefighters, and members of our armed forces. From time to time, the tree of liberty must be watered with the blood of tyrants and patriots. He loves his country best who strives to make it best. May the sun in his course visit no land more free, more happy, more lovely, than this our own country! Fold the whole earth in peace. America's veterans deserve the very best health care because they've earned it. Regard your soldiers as your children, and they will follow you into the deepest valleys. Look on them as your own beloved sons, and they will stand by you even unto death! Soldiers are men... most apt for all manner of services and best able to support and endure the infinite toils and continual hazards of war. ~ General George S. Patton, Jr. But fame is theirs - and future daysOn pillar'd brass shall tell their praise;Shall tell - when cold neglect is dead -'These for their country fought and bled'. I hope you enjoy this patriotic military tribute with music by Toby Keith "American Soldier".